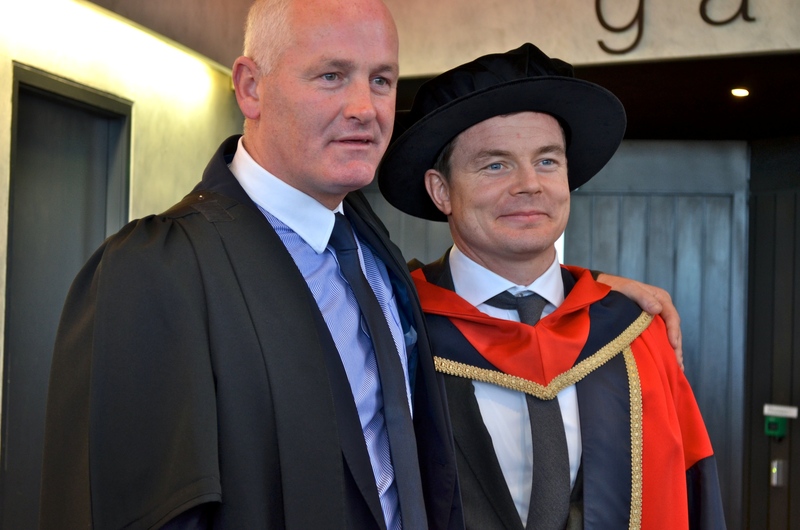 The achievements of sporting heroes Sean Kelly, Brian O’Driscoll and Katie Taylor were recognised by DCU this morning, when all three were awarded the doctorate of philosophy by President Briain MacCraith – the highest honour bestowed by DCU. As Brian O’Driscoll took to the stand to speak, he said that being referred to as Dr. Brian O’Driscoll sounded “really bizarre”. He too was “absolutely delighted and truly humbled” to receive the highest honour that DCU had to offer. He said that, as a team player, he was “never truly comfortable being singled out” but said that it felt “pretty great” to stand on the stage of the Helix to receive the award. He was quick to point out his respect for the talent of his co-recipients, singling out specific achievements by both Kelly and Taylor as examples of their talent and work ethic. He took a moment to explain how rugby has changed since he turned professional in 1999. He fondly remembered the days when the team would rush to get changed after training to be the first one to the local pub for a few pints. He said that they might go out again on Saturday night and that a few “settlers” on Sunday were necessary too. He then joked that they “always wondered why they couldn’t win matches”. He attributed the success of Irish rugby in recent years to the emergence of players such as Shane Horgan and Peter Stringer, who didn’t want to settle for being “valiant losers”, but pushed the team to make a serious effort. According to O’Driscoll, a successful sporting career is often achieved by “merging talent with hard work”, which can certainly be said of the three people honoured this morning. O’Driscoll attended the ceremony with his parents, who he thanked for their support over the years, particularly the “taxi service” they provided when he was younger. His wife, Amy Huberman, was also in the audience with their daughter Sadie, who contributed a few unrecognisable shouts as her father spoke. He concluded that receiving the doctorate was an honour that he will “remember and cherish for a long time”. He also added that he expects his Irish teammates to greet him as Dr. O’Driscoll when he shows up for training later, ahead of Ireland’s match against Australia on Saturday. Described by Deputy President Jim Dowling as “arguably the best rugby player ever”, the former Irish captain has also had a highly decorated career, so far, including winning three Triple Crowns and a Grand Slam with Ireland in the Six Nations competition. He is the highest scoring player in his position ever, the most capped Irish player, and the second most capped player in history, with 134 test matches between Ireland and The Lions team. Despite having such a successful career, he remains modest and has an unassuming nature. He is very involved in charity; his recent testimonial dinners in London and Dublin raised €2 million for Temple Street Children’s Hospital and the ISPCC alone. Katie Taylor was unable to attend due to training commitments in preparation for upcoming fights. Briain MacCraith took the opportunity to highlight her ambition to succeed in qualifying for the Olympic Games in Rio de Janeiro in 2016. Although absent, Olympic gold-medallist Katie Taylor’s achievements were celebrated nonetheless. As well as being Olympic champion, she is also won 14 other amateur titles, and was the flag bearer of the Irish Olympians in London last year. The 27 year old boxer from Bray hopes to come to DCU in the near future, whenever she can find a gap in her busy training schedule. Cyclist Sean Kelly was admittedly nervous as he greeted the crowd before him this morning. He was truly humbled by the “magnificent honour” it was to receive the doctorate from DCU and spoke of how he never had the opportunity to receive a third level education. He said that he “wasn’t a lover of school” and that when his father was sick, it gave him an “excuse” to leave, as the running of the family farm fell on him. However, he admitted that he has always regretted not continuing his academic endeavours. He said that it is much easier in these days to continue an education while pursuing a sporting career, a luxury that he did not have. Kelly’s brother introduced him to competitive cycling when he was 14, and since then he has become one of the most decorated professional cyclists in history, having won a total of 193 professional races, including the Vuelta a España and multiple wins in the Giro di Lombardia, Milan. He has also completed the gruelling Tour de France 12 times in total. Since his retirement form professional cycling, Kelly has been involved in the founding of the Sean Kelly Cycling Academy in Belgium and launched Ireland’s first professional cycling team in 2006, The Sean Kelly Team. He is also very involved in long-distance cycles for Blazing Saddles, a charity raising money for the blind and partially sighted.